Letting go Part 2 – But How? A few weeks ago I was at a seminar with a lot of stressed people and highly charged emotions. I found myself reacting with judgment and anger as my own ego sensitivities and vulnerabilities were triggered. I finally got so sick and tired of carrying around the weight of all these emotions, impressions, judgments about other people, and fears about myself, that I remember thinking “I just want this all to be gone!” I had an insight in that moment that I could make the choice to let it all go – just drop it. And so I did. I imagined all that weight like carrying a huge stack of books and just dropped it all. What a relief! I’d love to take credit for my sudden insight, but I have to admit that it was another marvelous progression on this Journey of Life. Many months ago one of my yoga students mentioned The Sedona Method. She had been to a seminar and tried to explain it to me. I didn’t really get it at the time, but it seemed interesting. A short while later, I saw the book in my chiropractor’s office and read a few pages which sparked my interest, but didn’t really explain the method. I still wasn’t interested enough to buy the book. So when I started to get tired of all my emotional wrangling, I asked (of Source) “How should I deal with this?” The answer came back “The Sedona Method.” I still wasn’t convinced enough to pay for the book, (after all it could have been my “imagination” that was answering, right?) so I called the person who first mentioned it to me and asked her if she could lend me the book. She was generous enough to also lend me the CDs from her seminar. I finally started listening to the CDs after the seminar mentioned above, and smiled as I realized that the Sedona Method is all about letting go. I had already been guided by Source into the process of the Method before knowing that I was doing it – fun! So what is this Sedona Method? Based on what I’ve learned so far, it’s very simple (I love simple!) First you acknowledge what you’re feeling. Hale Dwoskin is the author of the book and describes “welcoming” the emotion. I don’t relate well to the word “welcoming,” but I prefer to recognize what I’m feeling with interest. For me, it also works to check into what is below the surface emotion. Most often I’ve found fear in many guises – vulnerability, embarrassment, shame, doubt. So the Method says: Can you welcome what you’re feeling? Could you let it go? Would you let it go? When? Sometimes, as Wayne Dyer mentions in his Excuses Be Gone audiobook, you just have to be tired enough of your situation to be willing to change. The question asked in The Sedona Method is: would you rather continue to suffer, or would you rather be free? It’s really that simple. The reasons that we hold on are complicated what makes it complicated. So, given the option, or the opportunity to be free, why would anyone continue to suffer? I’ve found that sometimes the suffering is more familiar. Sometimes we’ve held on to it for so long that we don’t know who we’d be without it – there is an existential fear that we would somehow cease to exist if we change our current state, or that we would lose something of who we are. This is usually because we identify our emotions as who we are, rather than recognizing them as temporal states of being over which we can have control. Sometimes the suffering allows us to blame someone else rather than looking at our own responsibility in the situation. And sometimes, the suffering is a cover for a deeper sense of vulnerability that we feel incapable of facing. Dwoskin mentions in the audio series the people often step into the fire of their emotions, feel overwhelmed, and then jump right out. The difficult emotions, however are the surface crust over the peaceful center that exists within each of us. If we can be courageous enough to spend some time getting through the crust, we can eventually get to that peaceful core. I’m not insinuating that it is easy. Having worked with trauma survivors in psychotherapy, and having worked with my own issues, I know that it can take time to develop the willingness and the skills to be able to experience and observe our difficult emotions without being overwhelmed. Part of the challenge is to be able to hold our emotional states and observe ourselves gently, and with curiosity, rather than identifying our emotions as who we are: “I am weak” is not the same as “I feel weak.” The second statement allows some detachment from the emotion. Mindfulness meditation or mindfulness practice helps us to cultivate the ability to hold our emotions in awareness with detachment, so that we don’t become overwhelmed. For some people, simply being able to be present with an emotion releases its hold. Accessing the body as an information source is also helpful. After all, emotions live in the body. For instance, how do you know that you’re feeling anxious? Butterflies in the stomach, heart racing, shoulders drawn up to the ears, maybe habitual gesturing with the hands? Sensorimotor (body-centered) psychotheraphy is based on the premise that rather than just talking, which is a brain-centered activity that happens above the neck, we must get into the place where the emotions actually exist – the body – and work with & release them there. Perhaps this is why yoga is so effective as a healing system. This is also why people often find emotional release through physical activity and through bodywork (such as massage or rolfing). The body allows us to access emotional states that the mind might not even recognize or be willing to handle. I’ve seen significant changes come about through body-centered psychotherapy both as a therapist and as a client. So based on my interest and experience with body-centered psychotherapy, and based on my own inclination to work kinesthetically, I use this physiological awareness with the Sedona Method, recognizing where the emotions live in my body and then making the choice to let them go. Sometimes I also like to use visual imagery, to see the emotions dissolve, and disappear into thin air. Some people who are more verbal might like to use words or phrases. I’ve had some interesting revelations into my own process since I started this intense work of releasing. It has been challenging at times to accept what I’m uncovering, and at time it has been really fun – I highly recommend it. 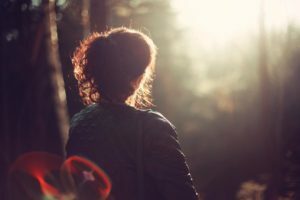 Author FrancinePosted on September 7, 2009 Categories A Conscious Life, Change, Meditation, Overcoming stress, Personal Peace, Spirituality, Uncategorized, YogaLeave a comment on Letting go Part 2 – But How? As a yoga instructor I hear a lot of people talk about how stressed they are. It occurred to me a while ago that our lack of mindfulness might be contributing low-level stressors that increase our daily stress level without us even realizing it. 1. Be where you are. Eckhart Tolle said in The Power of Now that stress is being in one place, but wanting to be in another. Simply put, if you’re at work but wishing you were on vacation, this creates stress. Similarly, if you’re mentally at work while on vacation, you create stress on your vacation! Makes sense, right? This is also the yogic principle of santosha – being present with what is. 2. Eat when you’re hungry. Get enough sleep. Use the bathroom when you need to. Really. Sounds simple, but the needs of the body can be insistent. Stress lives in your body, so the more you abuse your body, and ignore its basic needs, the more stress you create. You also prevent your body from being able to tolerate other stressors that might come up. A healthy and well-respected body should also make you more efficient and more productive. 3. Don’t procrastinate. Putting things off just keeps them on that to-do list in the back of your mind that’s always nagging at you. Take care of tasks a little at a time if need be. Let Facebook and TV be the rewards for getting things done – not the distractions. 4. Do one thing at a time. It is an illusion that you can actually multitask – from what I’ve read, brains don’t work that way. Instead, the attempt to do multiple things at once creates an unnecessary level of stress that could be alleviated by simply focusing on one task at a time (including eating meals or being with your kids). 5. Meditate – even for 10mins per day. Daily meditation has been shown to positively affect the body’s biochemistry. If meditation doesn’t appeal to you, find another practice that helps you to find that state of connection with yourself. Yoga, Tai Chi, Qi Gong, martial arts, running, fencing, swimming… there’s something for everyone. 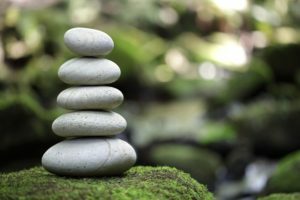 But don’t just pick something that emphasizes your already unbalanced tendencies – find something that helps you to grow into a more balanced state. 7. Study yourself & take responsibility for your own actions. The yogic principle of svadhyaya teaches us to study sacred texts in order to know ourselves better. Imagine what you could learn by studying the sacred texts of your own body and mind. In order to really know yourself, however, you have to be willing to recognize how you have contributed to our current state of life, and this cannot be accomplished by blaming others for your situation. 8. Recognize that it’s not all about you. This was a great lesson taught to be by a former coworker. How much of other people’s behavior do you take personally and allow to rattle your serenity, even to the point of making you hurt and angry? Can you entertain the possibility that maybe their behavior has everything to do with what’s happening in their lives and nothing to do with you? 9. Face your fears. How much does fear contribute to your daily low-level anxiety. What are you afraid of? Is your world view based on fear? Where did that fear come from – is it even yours, or was it inherited? How much of the way you relate to others is based on fear? What would happen if you related to the world with love, rather than with fear? 10. Love yourself. There isn’t much to be gained by beating up on yourself when you notice you’re not perfect (did you really think you were perfect?). If you make a mistake, treat yourself as compassionately as you would a close friend. Then learn from your mistake and move on. Just letting go of the mental anxiety we create by our self-loathing and project onto each other would go a long way to allowing Peace in the world. Hope this is helpful to someone besides me :-).